Back in May 2009, I wrote an article comparing the Chrome and Firefox browsers. Since then, it has been by far the most viewed page on my blog. From the day it was posted until today (almost six months), that particular article has accounted for about 80% of all pageviews on my blog. I’ve had days where 110 people visit my blog and 103 of them view that page and that page alone. I use mybloglog.com to track which pages are viewed the most and how people find my blog, and here’s a piece of the results for one day. Note that this is a fairly typical day. 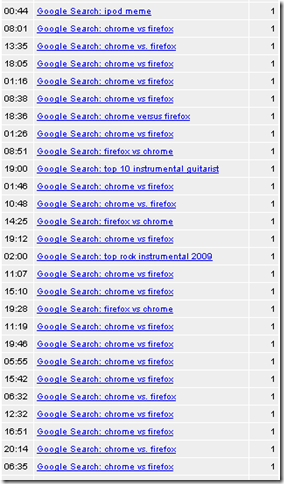 I don’t know why mybloglog can’t collapse all of the “chrome vs firefox” entries into one. Anyway, after about six months of using Chrome pretty much exclusively, I decided to revisit this comparison and see how much of it is still valid. To that end, I reset my default browser back to Firefox for a week. Note that I am comparing the “generally available” versions of Chrome (3.0.195.27) and Firefox (3.5.5), not development or beta builds. Chrome starts up almost instantly, while Firefox takes several seconds before it’s ready to go. Both are still faster than IE for me. Chrome updates itself completely silently. Firefox tells you there’s an update available and asks if you want to install it. Actually doing the install is pretty painless, but it asks you if you want to install the update when you start the browser, which is usually when you are trying to do something with it. Frequently I don’t want to wait while it installs an upgrade and then restarts itself, so I end up trying to remember to do it when I’m done. I have no idea when Chrome updates itself, because it does it silently in the background and then the changes take effect the next time you shut it down and start it again. Chrome searches your bookmarks and previously visited sites extremely quickly, so when I start to type a URL, it comes up with probable matches really fast. For example, I don’t have twitter.com bookmarked, but I can get there using tw because by the time I hit enter, Chrome has searched my previously visited sites and autocompleted “tw” to “twitter.com”. Until I started using Firefox again, I did not realize how cool this feature was and how quickly I came to depend on it. I would visit a site and not bookmark it, and then the next day if I wanted to find it again, I could type whatever part of the URL I could remember into the address bar and it would just find it for me. Chrome still doesn’t have plug-in support. If this isn’t number one on the “must get this done” list for Chrome, someone needs to be fired. Yes, I know this is at least mostly working in the dev builds. When Chrome isn’t going really fast, it seems to be going really really slow. I had a situation on my computer recently where everything seemed to be taking forever – compiling was taking 20-30 seconds per file (rather than the <1 it should take), and a test that was running at the same time was taking minutes rather than seconds. I looked at the task manager, and the two processes taking up the most CPU were Chrome and our stupid virus scanner that grinds my machine to a halt and IT won’t let me configure it despite the fact that it prevents me from doing my job efficiently (but that’s a rant for another day). I shut down Chrome, and within a few seconds everything sped up noticeably (though not as much as it should have because of the stupid virus scanner). I am going to keep an eye on this, but it may be a showstopper. Perhaps related to the previous problem – every now and again, usually when my machine is very busy, I enter a URL in the address bar, hit enter, and nothing happens. I have seen pauses of 30+ seconds before it even changes the status to “resolving whateverhost.com”. Firefox doesn’t have these complete blackouts, but just goes really slow in those situations. I rarely see this or the problem above (#2) at work, but it happens a lot at home – I think it may actually be related to the VPN I use. Bookmark support has been improved in Chrome to the point where this is no longer an advantage of Firefox. Firefox supports keymarks which Chrome does not, but Chrome’s searching of bookmarks is so fast this is hardly necessary, other than the magic %s searching thing that Firefox supports. XMarks support is still missing though (it’s in beta). On a site with lots of Flash (i.e. games), sometimes everything seems to slow down to a crawl after 10-15 minutes or so. Sometimes it speeds up again after a while, but other times I have to just give up on the game. This happens in both Chrome and Firefox. Don’t know about IE. For now, I’m going to stick with Chrome, but as I said above, I’m going to keep an eye out for machine slowdowns and see if closing Chrome fixes them. If that continues to happen, I will have to go back to Firefox. I kind of miss the plug-in support from Firefox, but Chrome is still pretty peppy and quite honestly, I feel like Firefox is starting to pick up the bloat that IE has had for years. Chrome still feels small and sleek. I’m surprised that adding plug-in support is taking as long as it is, but I also understand that this basically amounts to allowing the general public to add executable code to your application on the fly. Getting this right and making it usable and flexible while remaining robust is difficult. This entry was posted in Tech on November 22, 2009 by Graeme.